Love fireworks? Their bright colors and the festive atmosphere they create have enlivened many events, from the Fourth of July and birthdays, to graduations and concerts. However, before you focus on the fun, think ahead to mitigate hazards some fireworks pose. The best way to avoid an incident when using fireworks is by following the law. When using legal fireworks, Oregon law recommends you only ignite them on a flat surface outdoors in a clear area away from homes, dry leaves and grass, or other flammable materials. 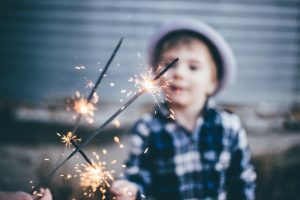 Legal fireworks include Cone Fountains, Flitter Sparklers, and novelty items that produce only smoke or ash and make a small noise, such as Party Poppers or Snakes. Illegal fireworks, include anything that explodes, flies 12 inches into the air, or travels more than six feet on the ground, such as Roman Candles, Bottle or Missile Rockets. If you are going to put on a fireworks display, it’s recommended you use protective eyewear, such as safety glasses or goggles. Keep a bucket of water nearby in case of incidents and for firework disposal. If a firework malfunctions, never try to relight it. Instead, soak it in water overnight and throw it away. It’s important to always read and follow all fireworks instructions and to never put fireworks in any sort of container—such as glass bottles or tin cans—as these objects can shatter and cause further injury. If noise is your thing, stock up on festive noisemakers, instruments, or make your own using dried beans and an empty can or pie tin. This is also a fun craft to do with the kids. If you’re in it for the bright colors, fill some balloons with festive eco-friendly paint and pop them on a safe surface, or create brightly colored sugar for a natural confetti alternative. To avoid the mess and inevitable clean-up, you can just fill balloons with LED lights and tether them close by. Confetti and silly string are other fun ways to celebrate without the risk. If you are going to use fireworks and have children, it’s important to keep in mind how dangerous they can be. Practicing good judgment and constant supervision is critical. For pets, providing quiet safe spaces is a necessity. You may also want to consider a thunder jacket, to help mitigate pet anxiety and white noise machines that can equalize sound. Another consideration? Veterans. Vets who suffer from PTSD can suffer anxiety, flashbacks, or relapse when fireworks are set off. Take care and consider alternatives when possible. However, if you just want to be festive, you can liven up any celebration with a few handfuls of glowsticks. Happy celebrating!